The most difficult thing about using Total Package Oxygen instrumentation is creating a proper validation standard. In other words, you need a solution with a known concentration of oxygen in order to validate your TPO instrumentation, but how do you get that? Since the concept of TPO was first published widely, the most referenced paper on the subject is the 1985 article in Brauwelt by Carlos Vilachá and Klaus Uhlig, “The Measurement of Low Levels of Oxygen in Bottled Beer.” It covers the best calculation to get TPO, but doesn’t talk about how to validate the results. Use room temperature beer that is at least 30 days old and preferably pasteurized, but not can-conditioned. 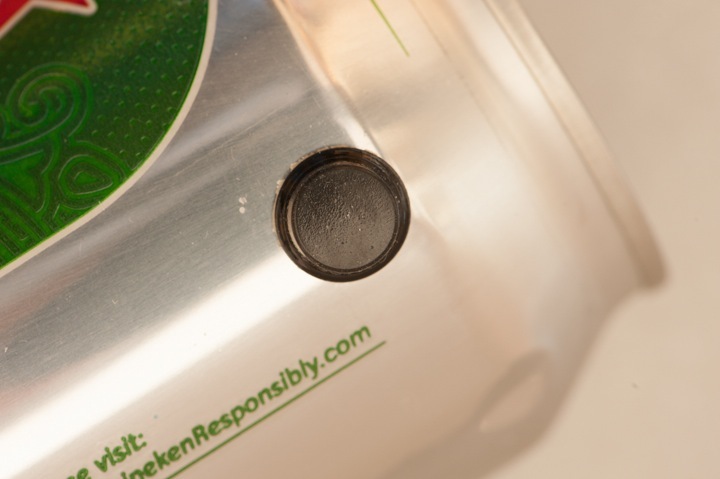 Place a sticky-back septum (most are pretty small, less than an inch in diameter) on the can and hold the septum on the can with a large hose clamp. 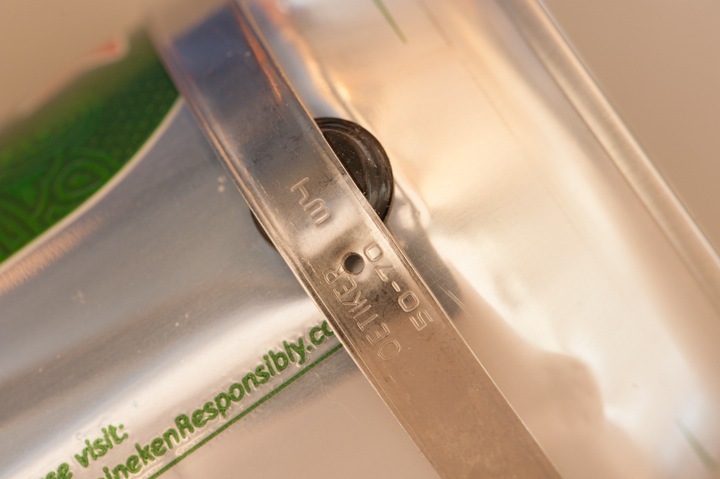 I recommend putting the septum on the upper edge of the can, where the can begins to neck into the seam, because the can is stronger in that location and will flex less. Tighten the hose clamp so you can still rotate it if you use some force. Make sure to center one of the hose clamp holes over your septum. 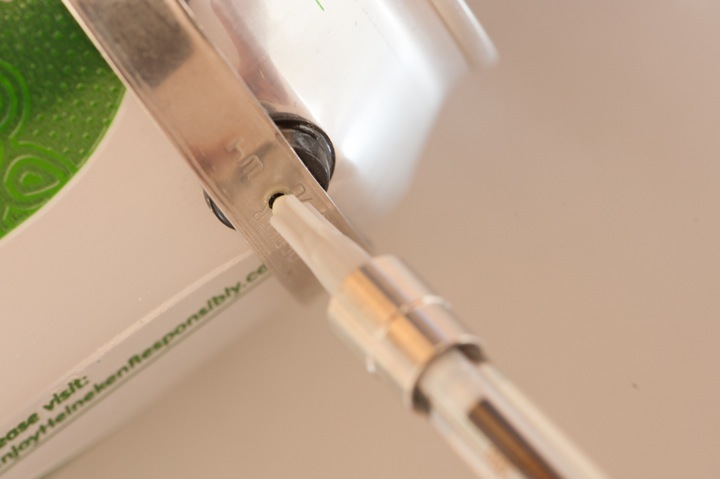 Using a gas-tight syringe, pull 200 to 300 μL of deaerated water into the syringe making sure that any air bubbles work their way to the tip of the barrel and can be expelled. Then push the plunger until there is 100 μL of water in the syringe and the needle if full of water. Next, pull the syringe until the tip of the plunger reads 300 μL. 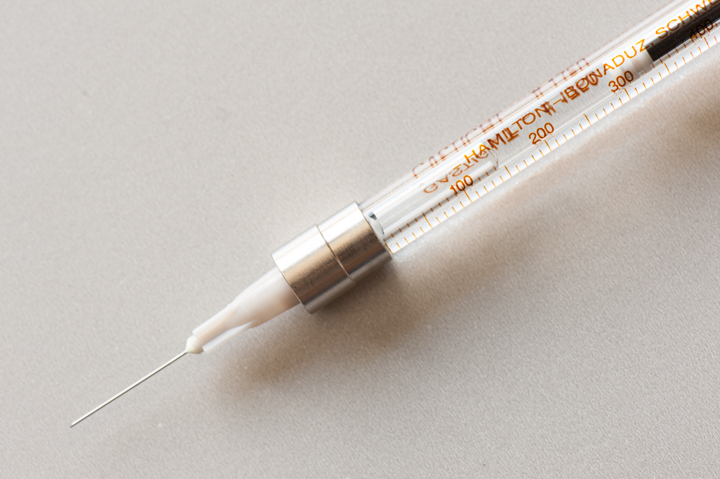 The syringe and needle will contain 200 μL of air, even though the plunger shows more water in the syringe. Note that this extra volume is from the now evacuated needle. Make sure the water stays touching the plunger. With the syringe, pierce through the septum and into the can and inject the air and water into the container. Then rotate the hose clamp so it blocks the hole where you injected the air and shake the can. 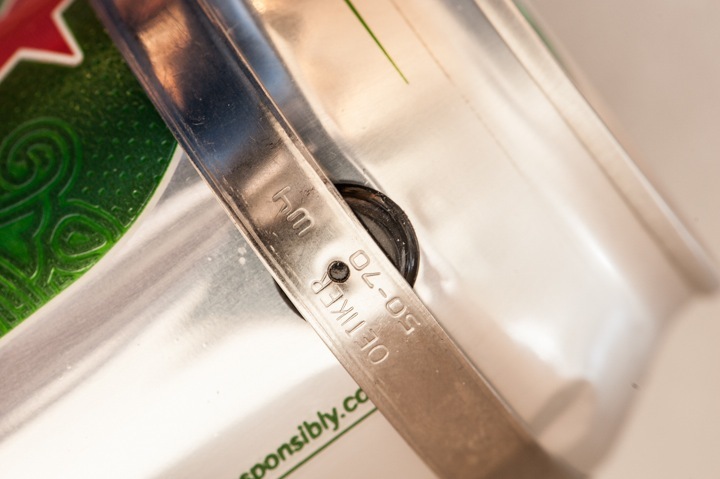 After shaking the can for three minutes, measure the dO2 and calculate the TPO. Next, calculate the mass of the oxygen in the air you used (based on whatever volume you used.) This will give you a value to compare to your TPO. Hach sells a kit that contains all the pieces you need, including detailed instructions for the procedure, as Part Number DG33373. 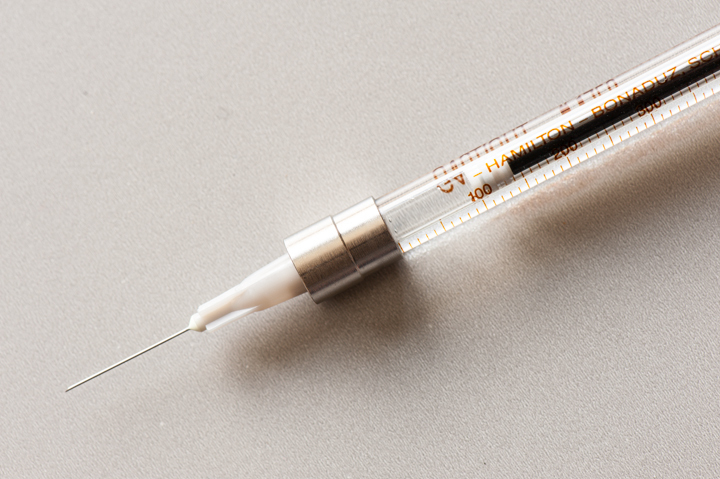 (Here’s a link to the syringe kit). You can also get septums, syringes, and needles from distributers like VWR and the hose clamp from your local hardware store. My final thought is two-fold. First, make sure you test your ability to do this procedure on multiple packages and get statistics on your percent recovery. If you’re getting great repeatability but not good accuracy, it may be the calibration of your instrument or your experimental technique. Second, some TPO instrumentation that places the oxygen probe directly in the headspace of the sample may not get valid or repeatable values due to the foam. While these instruments work very well on water samples, foam can affect their overall accuracy.